In these days of political mayhem, it seems most Christians take one of two routes: check in and report for duty as a good Christian conservative or liberal or check out and watch cat videos instead of the news. Well Keith Giles shows us a better way. A way that involves untangling Jesus from the madness that constrains Him…and us. A way that recenters us on the Kingdom of God. A way that encourages us to live for what really matters. How in the world the church got wrapped up into politics is beyond the scope of Keith’s book. But I found a couple topics he addressed to be absolutely crucial to getting untangled. The Flat approach to the Bible – Over and over again in Christian circles I am seeing a recurring theme of challenging the way we look at the bible. Keith’s take on a flat reading/approach was central to the theme of his book as it gives pause to pop interpretations that are in vogue today. The bible (I know it is typically capitalized) is far more dynamic than we will ever be able to discover. So, a simple “this means that” view does more harm to one’s faith than good…especially in relation to entangling faith with politics. Further, as Keith observes, a flat approach sees all of the scriptures as on par with one another…equally valid and in need to adherence. This goes a long way to putting empire back into the faith. The flat approach allows us to easily adopt a nationalistic view of our faith because that’s how it looks in the old testament. Yet, the scriptures of the new testament incredibly and increasingly challenge empire and warn against it. Keith does an excellent job of sifting through this and helping the reader see the nuanced differences in the ways we approach the bible. The Sacral Society – Here Keith follows up what he started with the approach to reading the bible. The issue of a sacral society is more often than not assumed than it is challenged. Case in point, I grew up in a church that had both an American flag and a Christian flag to the left and right of the altar. I never questioned or challenged that until at least 30 years into my faith. Keith tackles this head on in chapter eleven and handles it quite well. The whole argument of legislating morality vs. the power of the gospel is laid out quite well by Keith and it becomes clear to the reader that one must at least question the association of the two. At best, we come to realize that the way of Jesus was never meant to be the way of empire. So, I highly recommend this book. 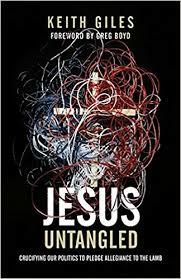 It was incredibly insightful and would be helpful to anyone enmeshed in both faith and politics. We can only serve one master…choose carefully, and with eyes wide open.